Electronic Arts is making a few changes in the FIFA 16 edition of FIFA Ultimate Team, including bringing back the Transfer Market to the web and mobile companion apps, and opening the season with wider price ranges than appeared in 2015. The idea, as it has said in previous years, is to ensure the game remains "fun, fair, and secure" for everyone. EA disabled access to the Transfer Market through the web and mobile apps last year to help cut down on unauthorized coin trading. It said at the time that the measure was temporary, and today it followed through on that promise with an announcement that access will be returned to both companion apps as of September 17. There will be one limitation, however: All returning and verified FIFA Ultimate Team 15 players will be able to leap into the Transfer Market immediately, but newcomers will have to play on either a PC or console for a few days first. EA said the restriction has been put into place to help keep bots out of the Transfer Market by ensuring that everyone with access to it is a human. For similar reasons, price ranges, which establish a minimum and maximum value of players on the Transfer Market, will be much wider at the start of the season than they were last year. "Our aim this year is to keep Price Ranges as wide as possible throughout the season to offer a fair environment for trading and to protect the market against coin buying," EA wrote. "The less coin farming and buying we see within FUT 16, the wider the Price Ranges will stay." That last bit is especially interesting in light of the not-entirely-positive reaction to the rollout of price ranges last year. 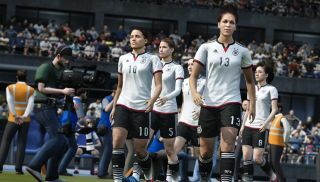 EA said at the time that they would help "to ensure a level playing field for all FUT fans," and claimed that they had in fact helped reduce illegitimate coin trading, but quite a number of FIFA players were vocally unhappy about the change. EA is also changing the Transfer Market economies so that coins, club items, and Transfer Market items cannot be shared between console generations. This isn't really our bag but if you ever spend any of your FUT time on a console you'll want to ensure you choose the right one when you set up your FUT 16 account. EA Sports has all the details.